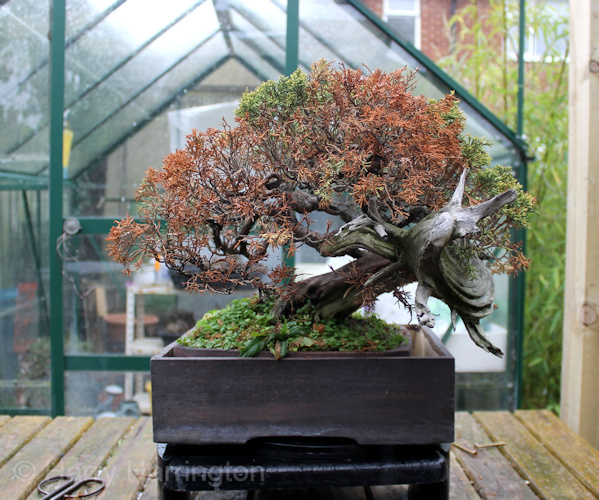 A sick and dying Juniper bonsai (Itoigawa) prior to treatment with, amongst other things, anti transpirant. 6 months later and the bonsai had recovered well and been re-styled. Anti-transpirant is a product that when sprayed onto the leaves of a sick or weak bonsai, reduces transpiration (or water loss) by up to 80%, greatly increasing its chances of survival. While water loss through the leaves is greatly reduced, the leaves are still able to function normally and photosynthesize. 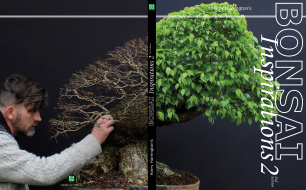 I've been using this product for a few years for newly collected material, weak trees and newly transplanted bonsai, particularly on tricky species. 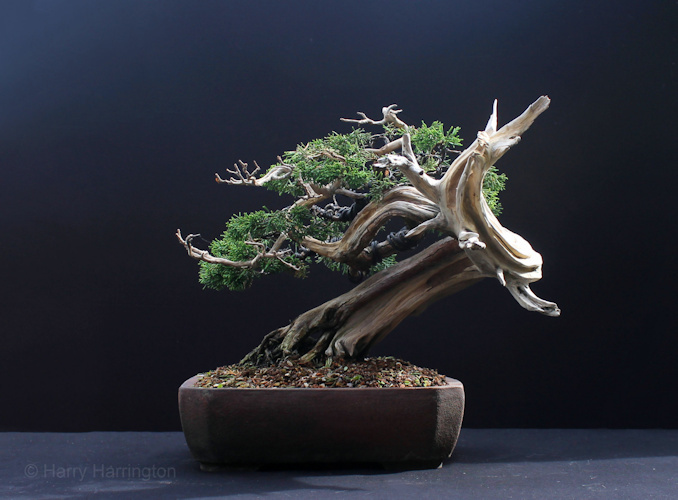 Probably the best example I have of the usefulness of anti-transpirant, is the Itoigawa juniper bonsai, pictured above, that came to me in a very bad way a couple of years ago, and was sprayed with anti-transpirant once a month to reduce further moisture loss from the leaves while the tree recovered and grew new roots. Totally harmless to bonsai, anti transpirants are made from natural pine oil emulsions. In addition to having many uses on weak or stressed trees, it is also very useful for increasing the cold-hardiness of healthy trees during the winter, as well as reducing the chances of leaf scorch on species such as Acer palmatum during the Summer. It helps protect plants when roots are frozen in the winter depriving them of their normal moisture intake as well as during periods of drought. Anti transpirant from Bonsai4me.com; unfortunately I am only able to ship to countries within Europe, however, there are products available to enthusiasts around the world. It's taken a couple of years to put together but I'm really pleased to be able to offer anti-transpirant. One of the problems with sourcing it, is that it is normally sold as a concentrate for GBP£100+ for 50 litres of spray, and most of us don't need this amount of the product. However, I have now mixed a batch of the leading brand (Wiltpruf) and decanted it into ready to use 500ml spray bottles. But, due to the difficulties of proving to Customs that the product is harmless and officially legal to ship, I can only offer this particular product to enthusiasts in the UK and Europe. However, there are similar anti transpirant products available to enthusiasts around the world and I would urge you to investigate available brands in your country. How frequently should you use Anti transpirant? The answer is, we don't really know! Anti transpirant allows the foliage to continue function normally so that it can still photosynthesize, while massively reducing moisture loss, by forming an invisible transparent coating over plant tissue. However, because the coating isn't visible, it is not possible to tell when more anti transpirant should be applied. However, it would seem to depend on how much rain there is, as water will eventually wash away the coating. As it is not possible to 'over-apply' the anti transpirant, and given the small size of most bonsai, during periods of no rain, I reapply the anti transpirant every couple of months, if it has rains a lot, every 3-4 weeks. Anti-transpirant for Bonsai Is Available At Bonsai4me/Shop (Europe only).